The Deli Presents Queen of Jeans May Residency Kickoff at Bourbon & Branch! 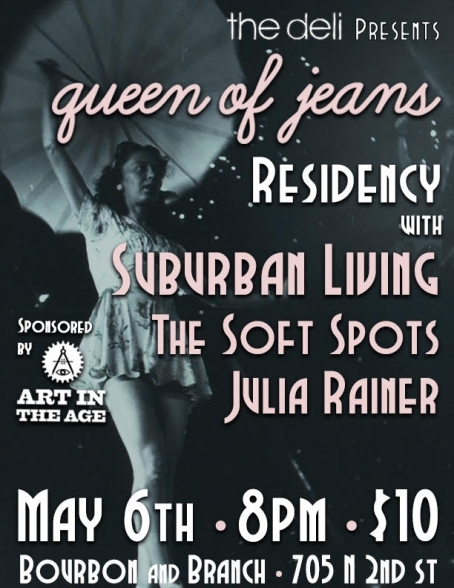 The "denimcore" ladies of Queen of Jeans will be hosting a series of shows this May at Bourbon & Branch, and The Deli Philly is happy to be presenting the kickoff bash for their month-long residency, which will also feature Suburban Living, The Soft Spots, Julia Rainer! And each Friday throughout May, they'll join forces with an eclectic cast of local music folks like Abi Reimold, Vita and the Woolf, and Curtis Cooper, whose shows will also be co-sponsored by our friends at WXPN, Y-Not Radio, JUMP, and Art in the Age. You can purchase your tickets HERE, and we highly suggest that you grab yours for The Deli event beforehand. It's a small room, and you don't want to get shutout!